Orthodox Christians from three post-Soviet nations – Russia, Ukraine and Belarus - are marking a very important religious holiday: the Christianization of Russia over a thousand years ago. ­The main celebrations are taking place in the Ukrainian capital, Kiev, the former center of the ancient state of Rus, at the site from where the Orthodox message started to spread across the nation. It has been exactly 1023 years since Kievan Russia adopted Orthodox Christianity. 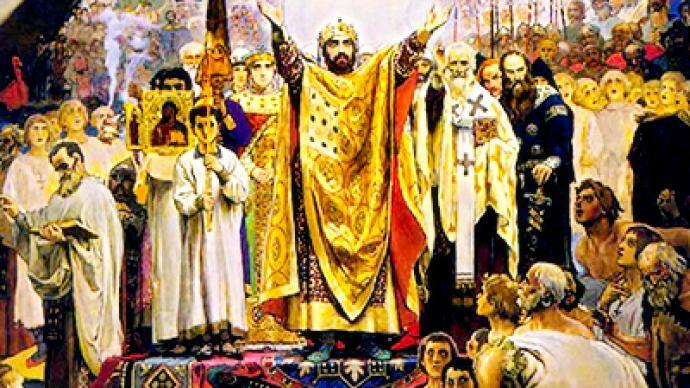 In 988AD, Prince Vladimir, who reigned over Kiev at the time, baptized the first citizens to become Orthodox Christians, choosing this religion over Islam and Judaism. The head of the Russian Orthodox Church, Patriarch Kirill, has arrived in the Ukrainian capital to take part in the celebrations along with his counterpart from Georgia and the head of the Russian Orthodox Church in Ukraine, Patriarch Vladimir. There is a large-scale celebration being held in the three capitals of Ukraine, Belarus and Russia: Kiev, Minsk and Moscow respectively. Since the collapse of the Soviet Union, the Orthodox Church in Ukraine has split into several parts. 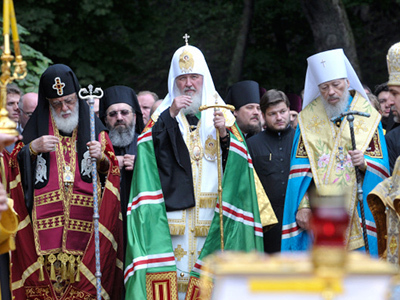 The Moscow Patriarchy of the Russian Orthodox Church undoubtedly has the largest representation. Over the last year there were calls that the Church must be united in Ukraine, but so far the efforts to make a single Church have been fruitless.